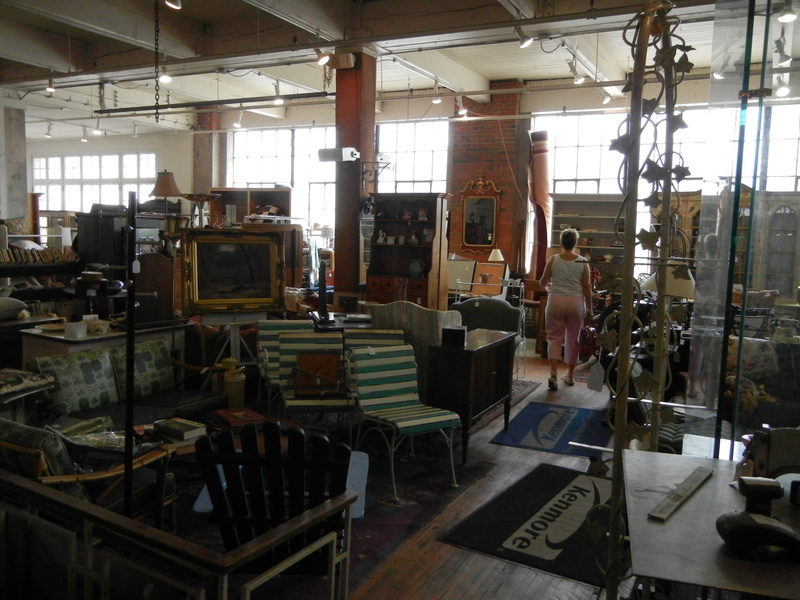 Midland Arts and Antiques is a place I’ve been wanting to check out for a while, but for some reason haven’t made it there yet. Greer and I went on a double mission. I have been wanting a library card catalog for a very long time. 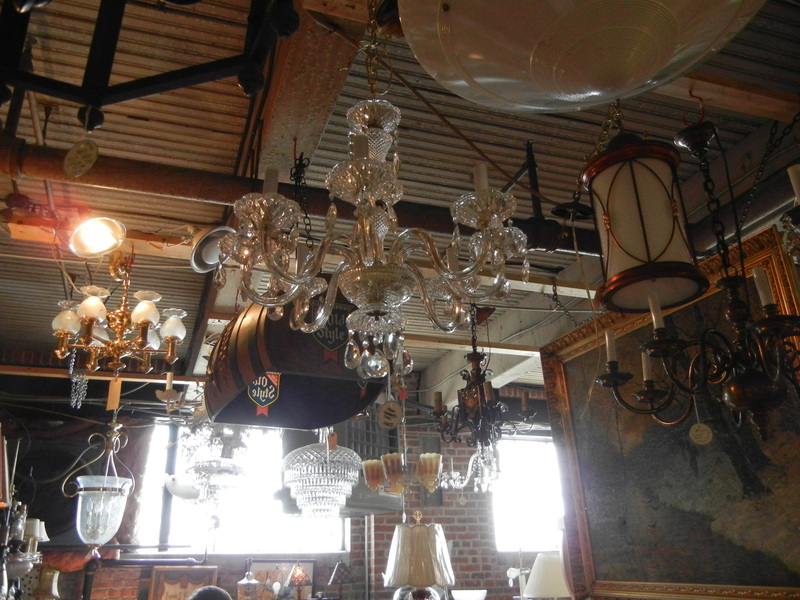 These are often very expensive, and I am very far from the $600 these popular pieces of furniture usually bring nowadays. I spent most of the end of last week super excited because I bid on one on ebay with a less traditional shape and whose starting bid (and bid until the last hour of it’s auction) was only $20. It would have taken a 3 hour drive to get it home, but Greer and I planned a Sunday road trip adventure and it was nothing but excitement. Until the last hour of the auction, that is, when someone outbid me. I’m not sure how high they bid, but at the last minute I upped my top bid from $50 to $75 and that wasn’t enough. Someday I’ll have one, when they are less popular and I have an income that is large enough to support furniture purchase that are more than $50. 🙂 Oh, and Greer was looking for a bed side table, something that was solid wood that she could either use as is or refinish to match her (adorable) white bedroom with bright pops of color. 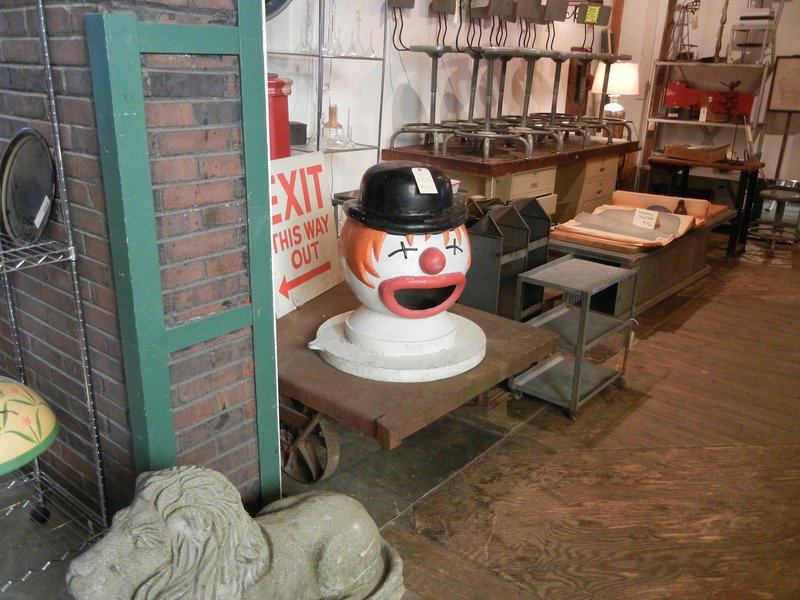 We didn’t find Greer’s table or my library card catalog (persay) but we did see some awesome (and occasionally scary) stuff. Scary exhibit A: There is another clown face on the other side. So weird. 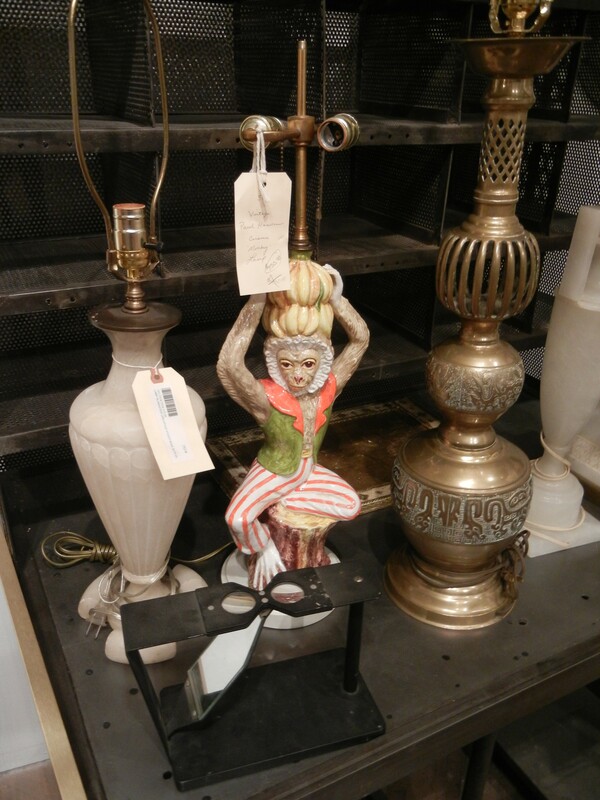 Strange Exhibit A: This monkey lamp can be yours for only $350! Really? Printers cabinet – I also love printer’s cabinets but definitely don’t have enough tiny stuff to fill up one of those. 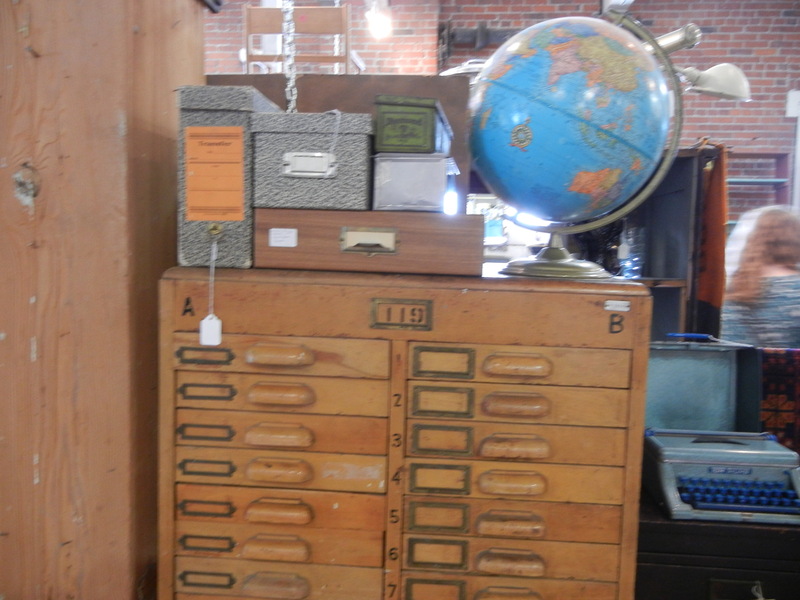 This one was reasonable priced because it was missing a few drawers. 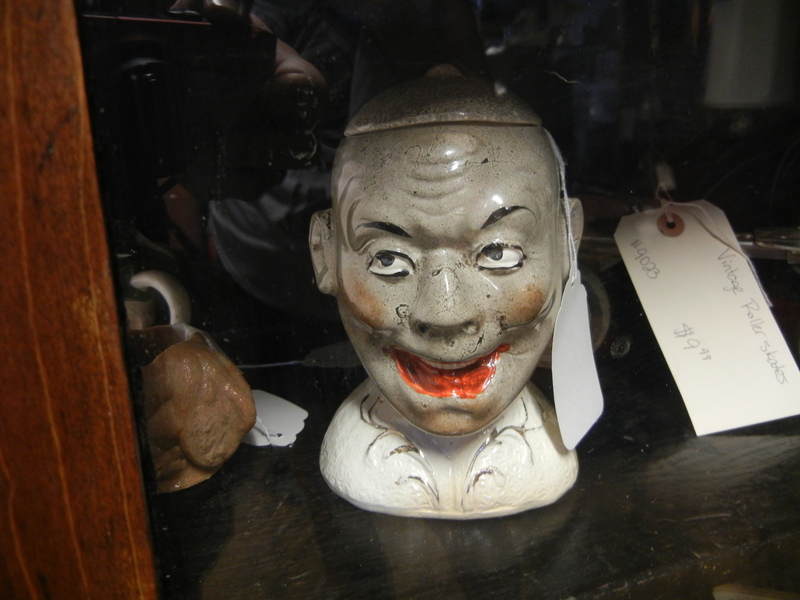 I’m not an antiques connoisseur by any means, but there weren’t many things that I balked at the cost of (except that monkey lamp). They may have been expensive, but I could see the value. Creepy Exhibit B: I have no words for this one. Right before we found this creeper Greer was like “Hey! You want a really old clarinet?” So I looked at it. Yep. Exact same one I own. Nice. 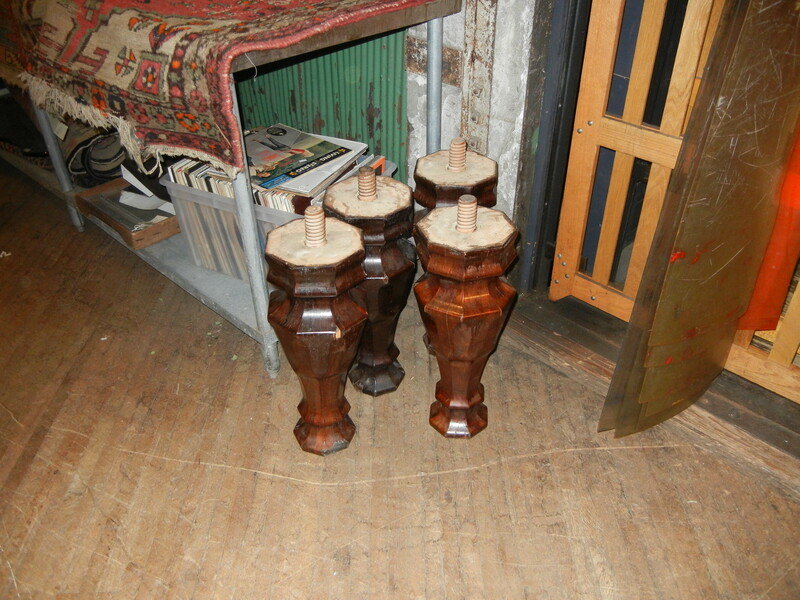 Giant table legs! Cause, you know. Why not? There was every manner of neat, outdated, odd (table legs with no table? marble countertops with no cabinet?) and amazing item there. At the end, it was a little overwhelming. 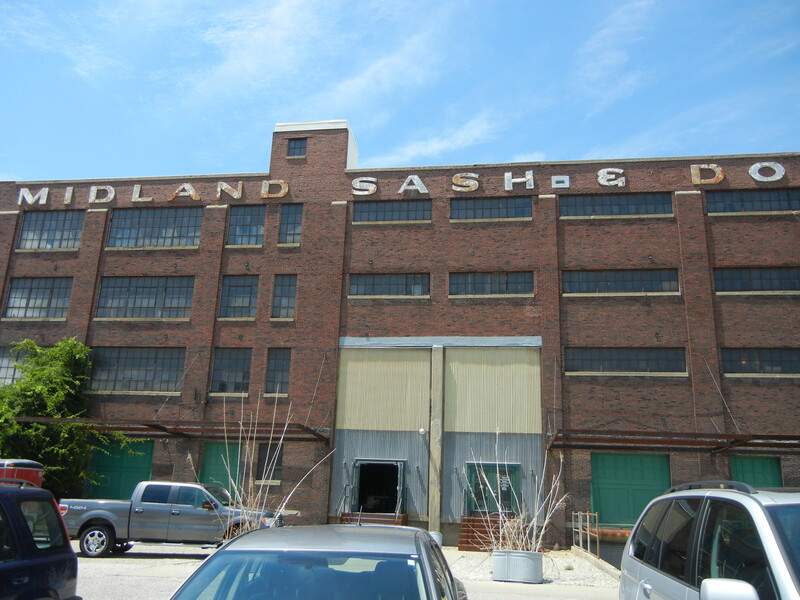 The place is two whole floors of a huge factory that used to make sashes and doors. We both felt like, if nothing else, it held a wealth of inspiration. All in all, a really neat place and definitely a place I know I’ll be returning to! 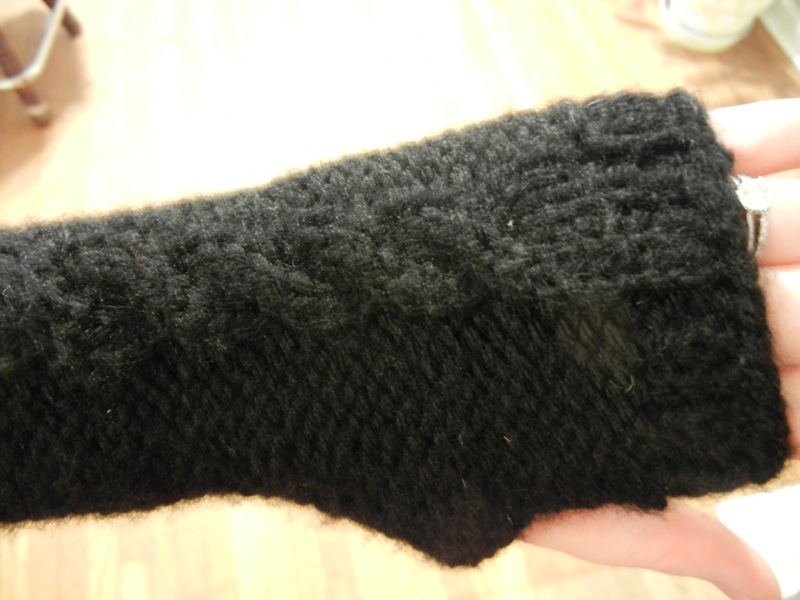 I have been doing a fair amount of knitting, but most of it was for a gift so I couldn’t tell you yet! 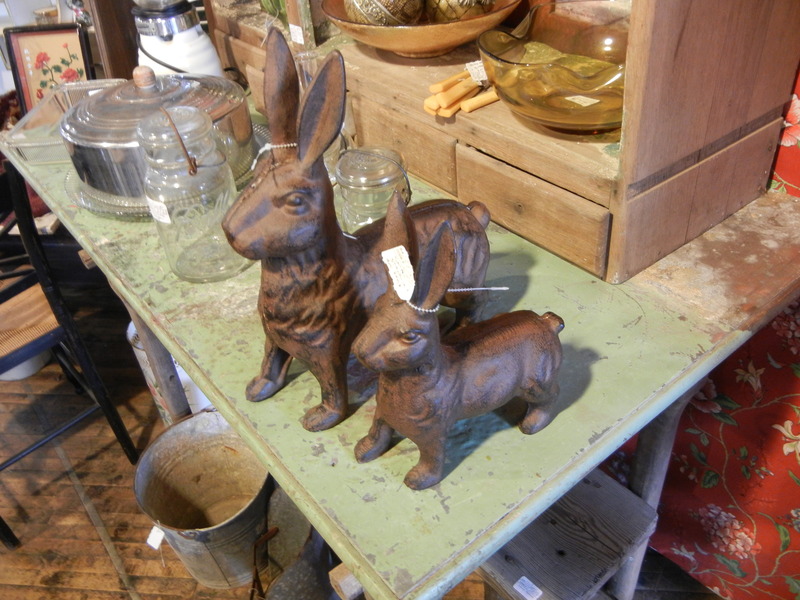 Our dear friends Frances and Jackson are expecting their first baby, well, any day now. 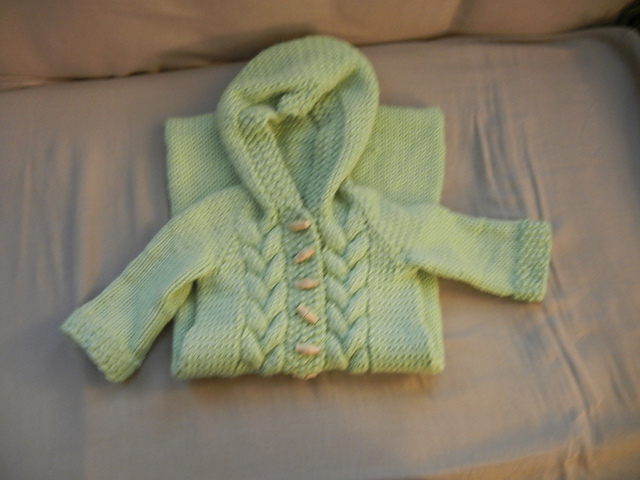 Now, I just can’t let anyone I love have their first child without getting at least a stitch or two of knitting. I really enjoyed these projects! I absolutely loved this pattern. 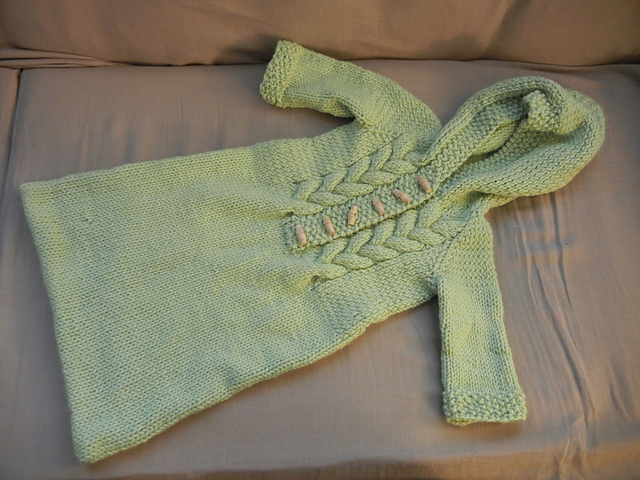 I used Berocco Vintage Chunky yarn, which was also lovely to work with. Sorry the picture quality is so bad. For reasons no one can know, I took this with my cell phone instead of my camera … and for those of you who haven’t experienced Hayao Miyazaki, I highly recommend any of his films! 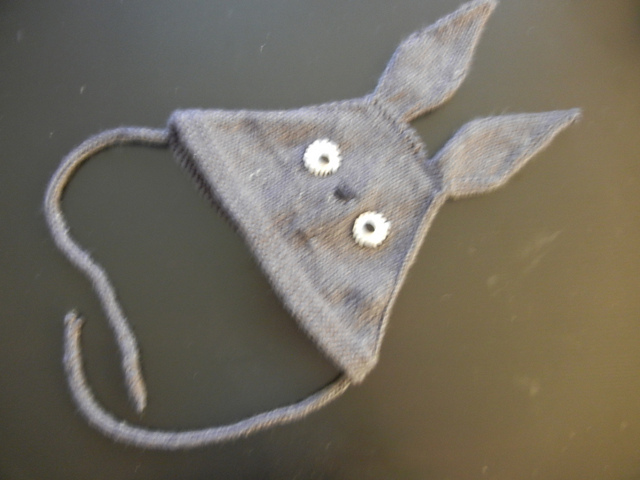 and I forgot in my original posting to include the pattern! 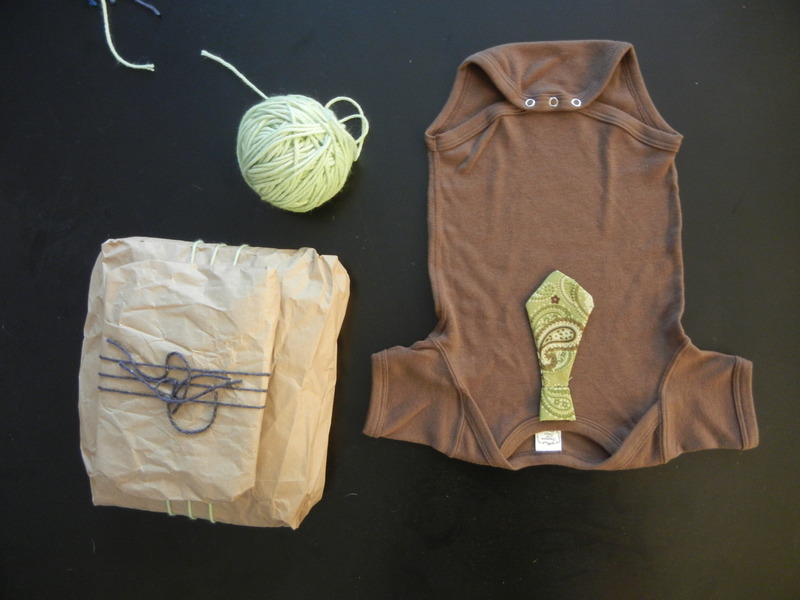 I’ve been saving up a few things to post in a new Etsy shop soon, and you can expect to see a few more baby tie onesies there! One of our favorite restaurants in Indianapolis is Broad Ripple Brewpub. They have great food, great beer and are a great place to take groups. Their menu holds an appealing variety and their specials change weekly. One of their specials are jalapeno poppers. When we ordered them the first time, I was expecting a pretty conventional popper. What came out were halved jalapenos in a delicious cheesy sauce. I attempted to recreate those poppers. 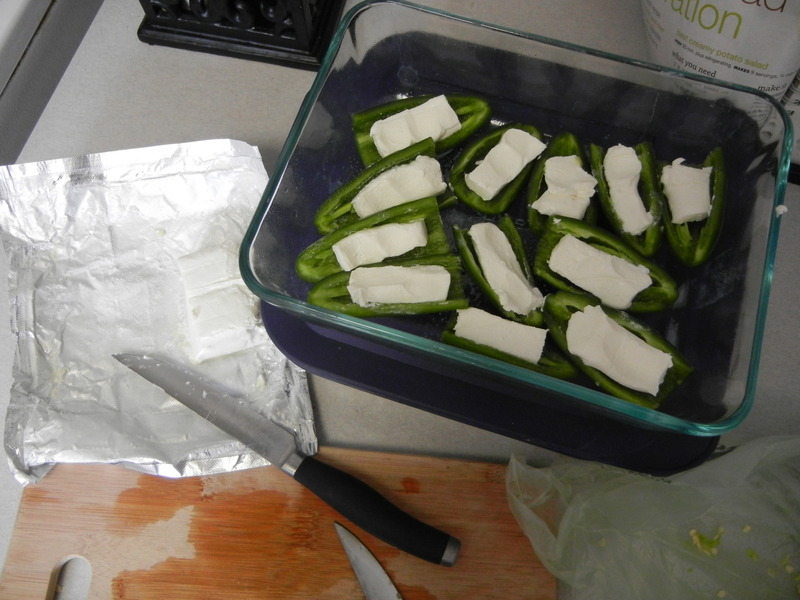 The first time I made them I just put a little block of cream cheese in each jalapeno half. The second time I made them I mixed freshly chopped garlic with cream cheese and filled the halves with that. 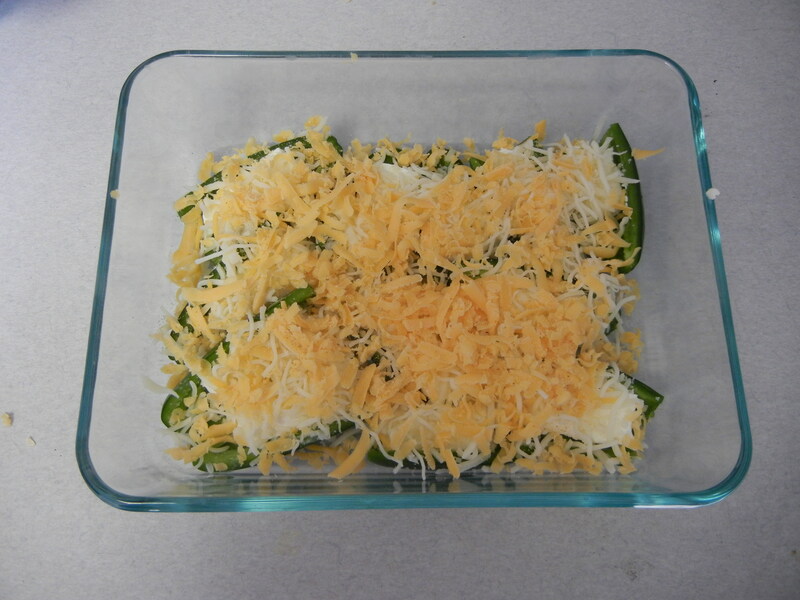 The next step is covering the jalapenos with shredded cheese. I use mozzarella and freshly shredded Cabot sharp cheddar and any other shredded cheese hanging out in the fridge. This batch includes shredded Mexican cheese blend. If you didn’t put garlic in the cream cheese, sprinkle a little garlic powder on now. The final step is to bake them. I bake them at around 350 degrees until the cheese is melted and I like to let it get a little brown and crunchy around the edges, about 15 to 20 minutes. 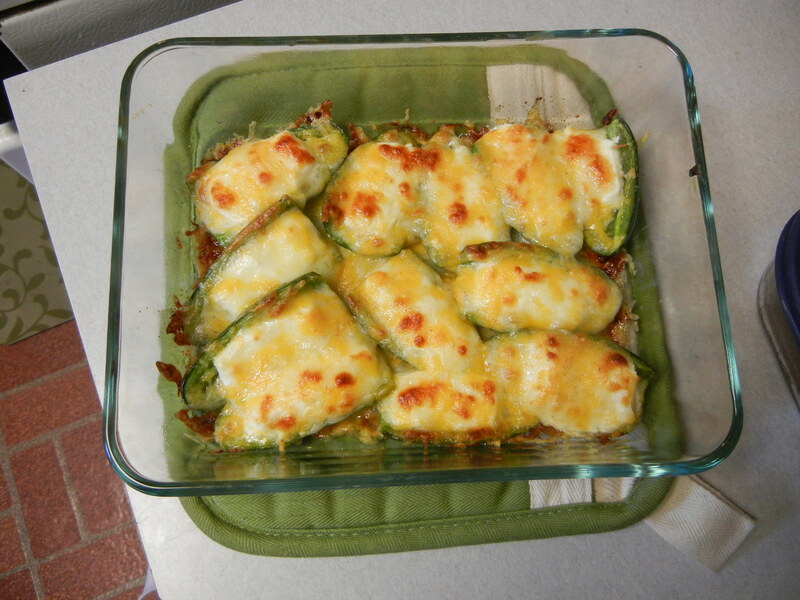 We do jalapeno poppers several ways, but these so far are my favorite! I hope everyone enjoyed their holiday and tried to stay cool! I found this great recipe that was a hit at the party we went to. It’s super easy, and perfect for any summer party! Enjoy! In a small saucepan, bring water and sugar to a simmer. Cook until sugar dissolves. Remove from heat and let cool. Fill pitcher with ice. Stir in simple syrup, vodka, juice, lemon and lime slices. 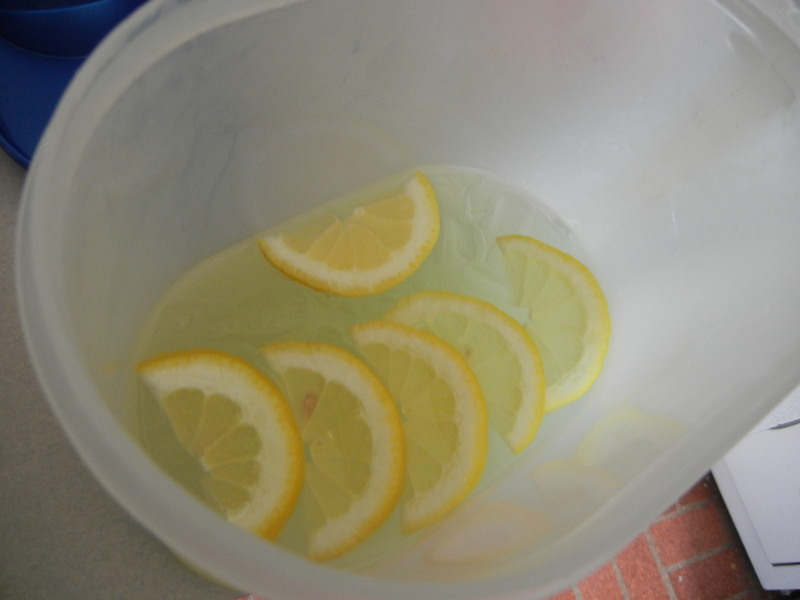 I used this recipe: http://www.foodnetwork.com/recipes/sunnys-hard-lemonade-recipe/index.html with a couple of modifications. For example, I bought a bottle of vanilla vodka rather than buying a bottle of plain vodka for the same price and a $12 vanilla bean. I also tripled the recipe, which made just under two gallons. I used two limes instead of one and one really huge lemon. I really love the coasters that look like they fell off a wall in some Tuscan kitchen, but haven’t been able to find them anywhere to buy, and if I do they want way more money than I am willing to pay for them. So to Pinterest I went! 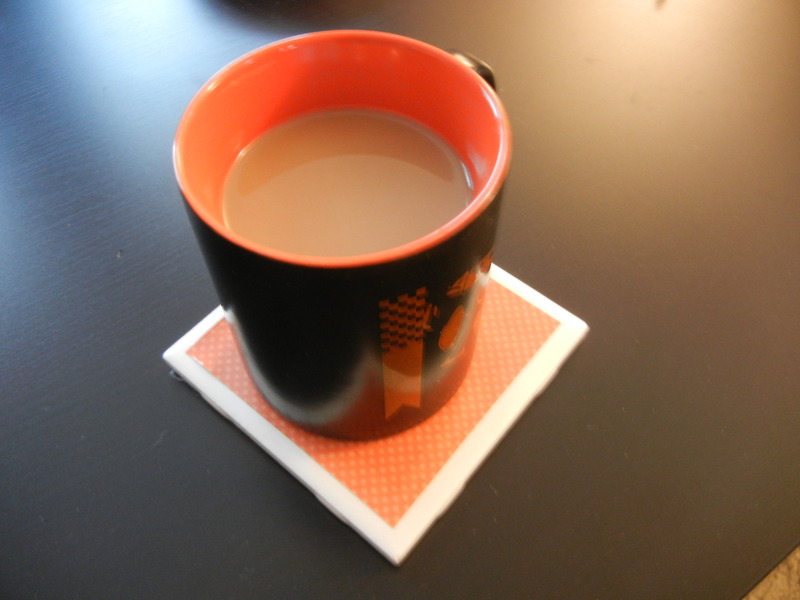 There are a ton of tutorials on making your own coasters using ceramic tiles. I kind of took a little bit from each one, and here’s what I came up with! I got ceramic coasters from Lowe’s. They were 18 cents apiece, and I got 10. 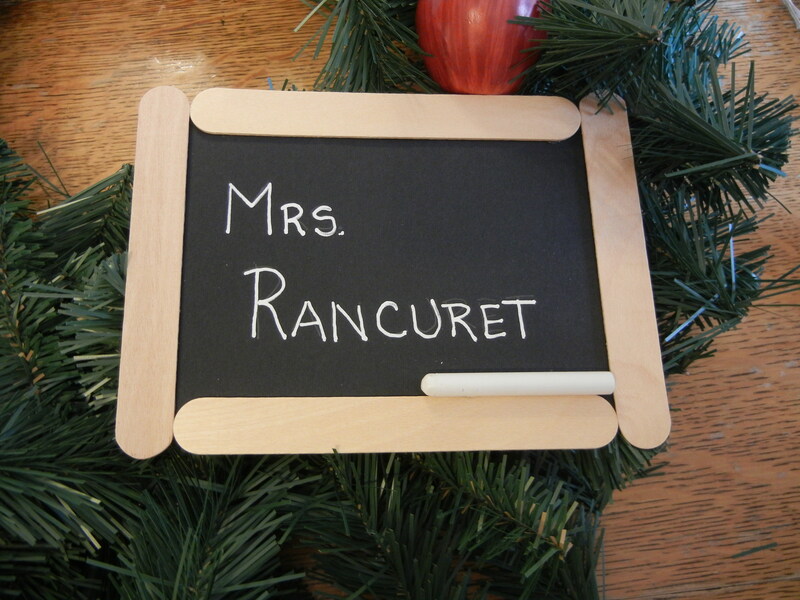 I really was trying to find some scrapbook paper with more of a painted, Tuscan feel, but I wasn’t having much luck. 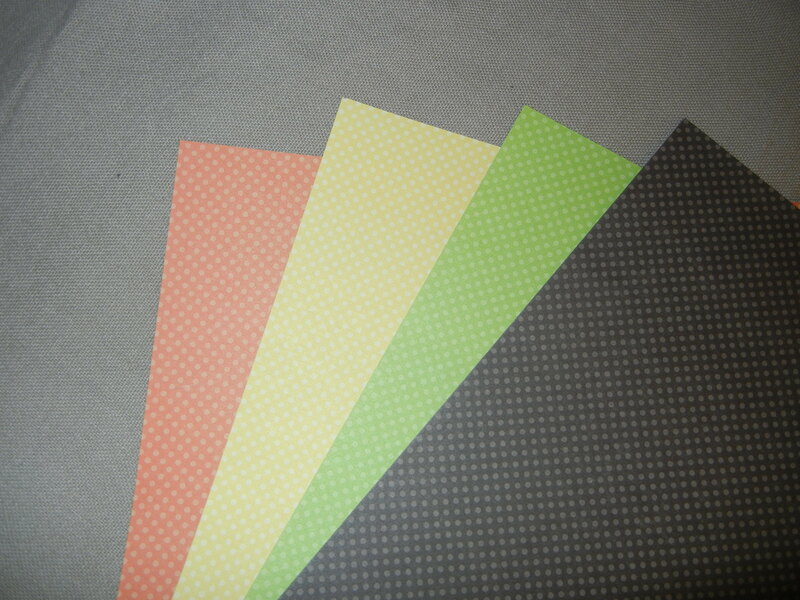 Then I found this cute polka dotted paper that came in all the colors I have in my living room. I kind of still have my eye out for something more intricate, but for now these are cute! My first step was cutting the paper to the right size. 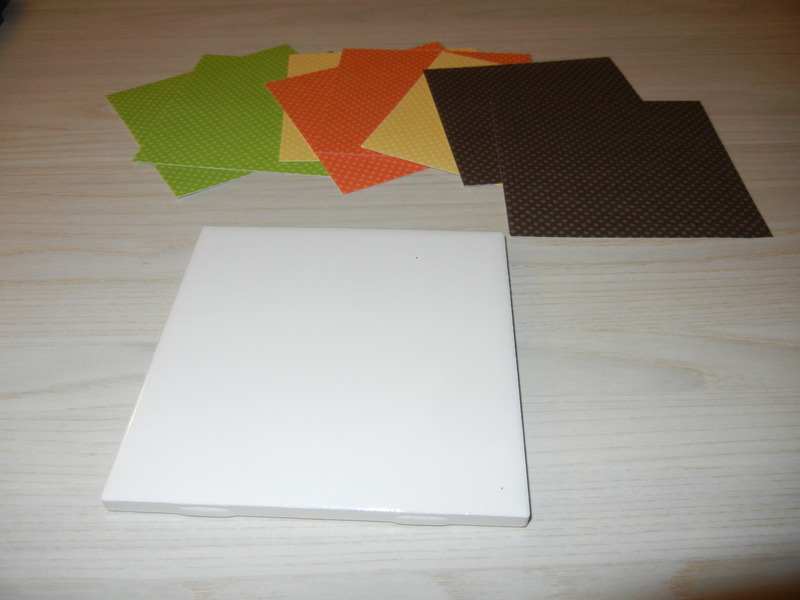 I wanted a white border to show around, so I cut the squares about 1/4″ shorter than the length and width of the tile. I decided to do two coasters in each color. My next step was to paint a thing layer of Mod Podge onto the coaster and place the paper in the center. I then painted a thin layer of Mod Podge over the scrapbook paper. I let those get good and dry. 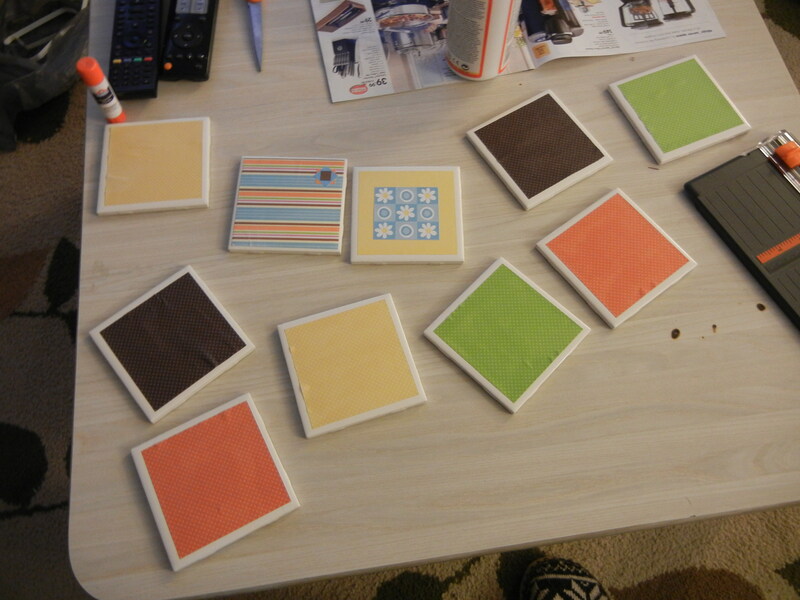 Drying coasters! The two that aren’t polka dotted were my practice round. I just used scrapbook paper I already had in my craft room. The coasters are in the craft room now, too. 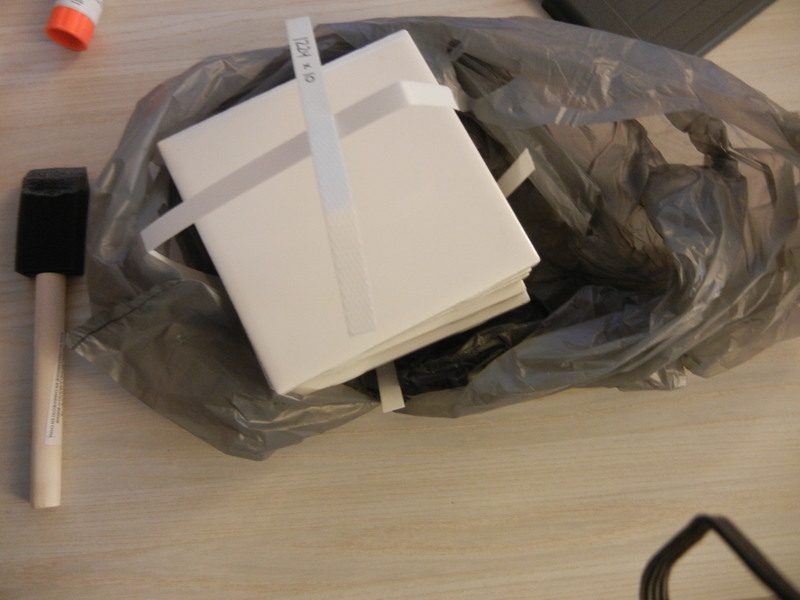 As you can see in the picture, I did get some bubbling and buckling in the paper when it was damp from the Mod Podge. This mostly went away when it was completely dry. 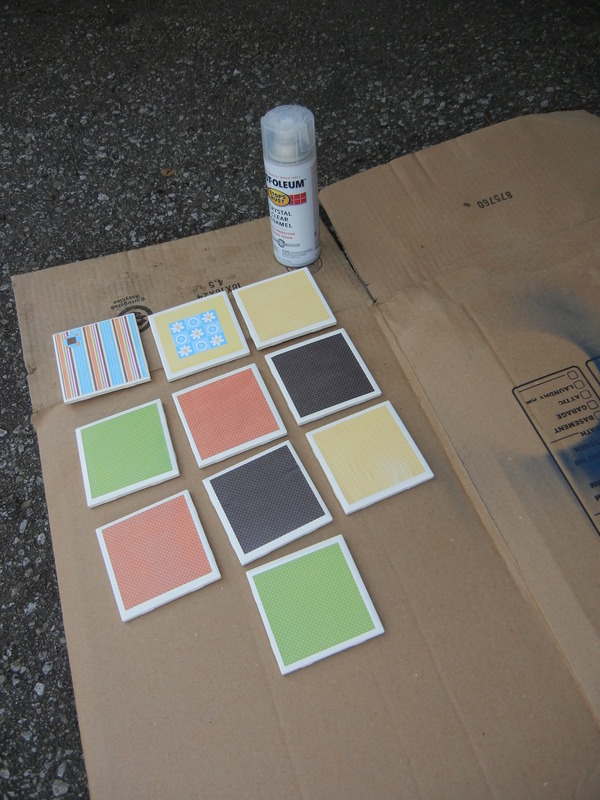 The last step was to seal them with some clear spray paint. I used something that was rated for outdoor as well so it would be water proof. 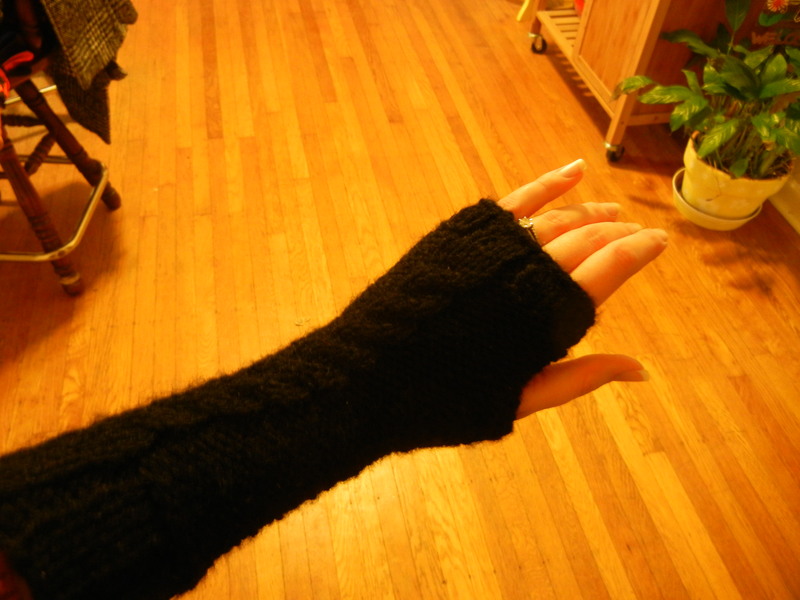 I put on about 4 coats I think. Most tutorials say one or two, but I wanted a glossier look than one or two coats gave me. I stopped at four because I didn’t want the paint to start to look yellow. After the paint was dry I let them air out for a couple of days on the back porch and then I glued felt squares to each corner on the bottom to keep it from scratching the table. They turned out pretty well, but we’ve been using them for a little while and there are a couple of things I unhappy with. They really are better for hot drinks because they do not absorb any of the water. The water tends to puddle on them, and one of them seems to be losing some of its paint because of that. Also, some of the bubbles in the paper that I had spray painted down have popped back up. This project is something I may revisit (or maybe just give up on!) in the future, but I definitely can’t complain when you look at the price! 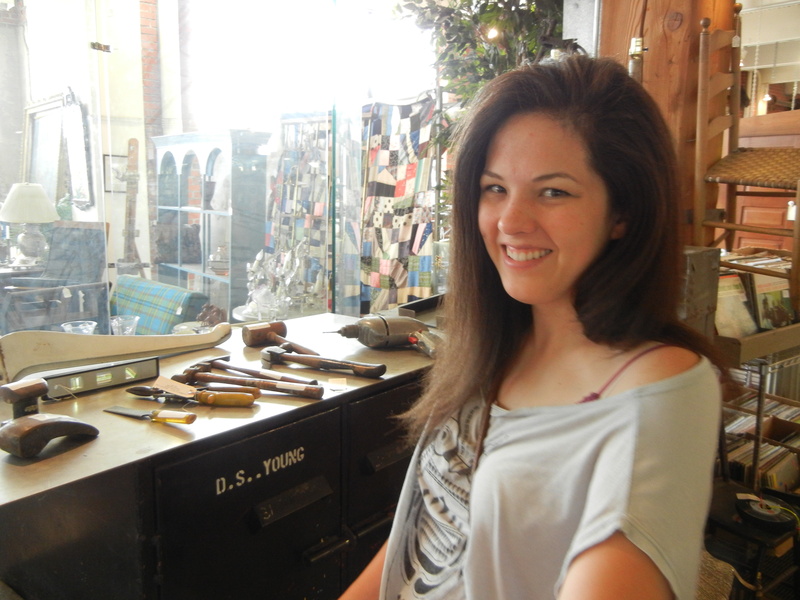 I had a hard time deciding what to get my lovely sister-in-law, Emily, for Christmas. It ranged from something to do with crochet (she crochets, I knit, we are both extremely challenged in the others’ craft) to a Fiestaware butter dish (something she mentioned wanting). I even tried to find their wedding registry (she got married in July) to buy something they didn’t get, but they were nowhere to be found. 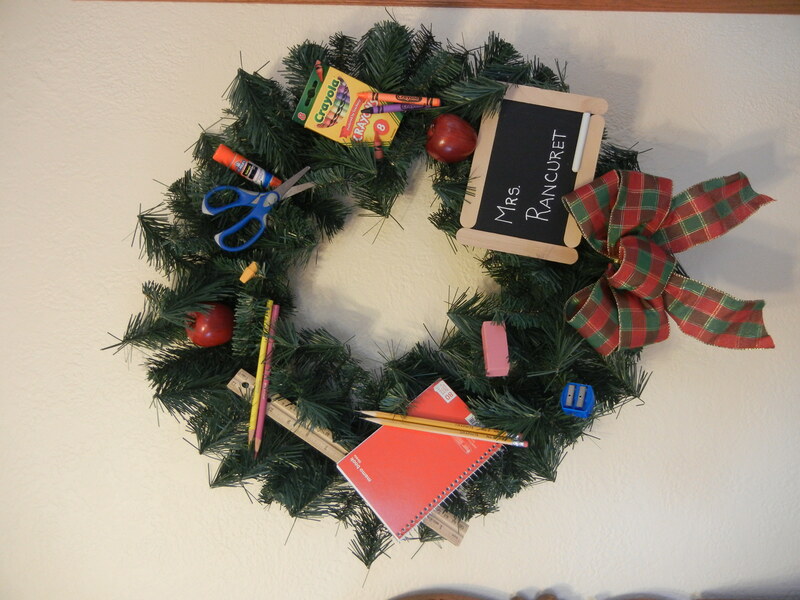 Then I thought of a cute project my mom made for my teacher cousin Amanda – a wreath decorated with school supplies. Emily teaches preschool right now, so I went with pretty basic stuff. Crayons, erasers, pencils. This could easily be adapted for someone who teaches another subject. Paint brushes and pastels for an art teacher, sheet music for the band director, etc. 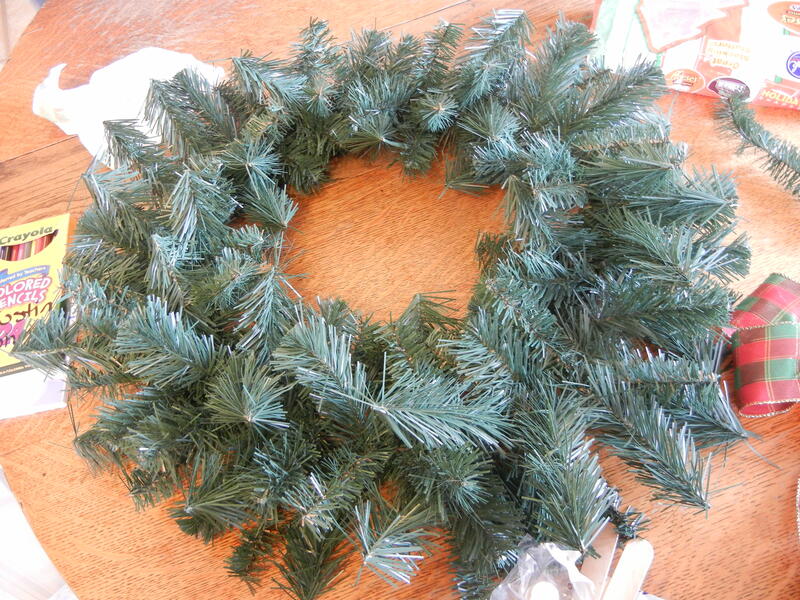 Then we just started laying the school supplies on the wreath. When we were happy with the placement, we secured them with copious amounts of hot glue. First of all, I know I am waaay behind. I’ve been incredibly busy, and as much as I love crafting, there have been other priorities, so I’m going to extend my deadline to the end of the winter.